Do you recognize the quote from which this Eye of Prophecy article draws its title? Have you read the book or watched the movie? It comes from the second bestselling novel ever written, with some 150 million copies sold. But don’t be all that self-conscious if you haven’t read the book (or watched the movies). Because if you are embarrassed, think how much more so I am for never (to date) having read one of the greatest American novels of all time, Gone with the Wind. However, I have seen the movie … several times! Also, I am relieved to say that I’ve read the bestselling novel of all time, A Tale of Two Cities, by Charles Dickens (200 million copies sold). And, of course, the bestselling non-fiction book of all time (by far); The Bible. Yes, I see some hands waving wildly … now you’ve got it. The novel: The Lord of the Rings, written by J.R.R. Tolkien. Actually it’s a Trilogy, as one book would be far too long. They are: The Fellowship of the Ring; The Two Towers; The Return of the King. Followed decades later by three award-winning movies of the same titles, directed by Peter Jackson. The evil ruler Sauron forged the all-powerful ring in the fires of Mordor; he would stop at nothing to regain the lost ring and use it to return to absolute power over Middle-Earth. Among other influences, the ring could merge the real world with the shadowy underworld of wicked spiritual forces. 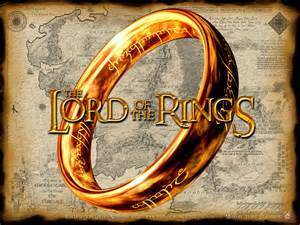 Only the ring (bearer) could unite the forces of evil rulers and kingdoms into a cohesive colossal confederation that, left unchecked, would conquer the world. Fortunately, there are those like the hobbits, elves, good wizards, and honorable men and women who love justice, righteousness, and peace. Those who are willing to give up comfort, tranquility, security. Those who would give their very lives to halt the relentless rampage of terror, power, and world conquest. It’s the stuff legends are made of; as are other classic works of fiction that seek to depict the past, present, and future real-life conflict between good and evil, heroes and villains. That successfully mirror and depict the factual rise and fall of kings and kingdoms. Although Tolkien’s fictional masterpiece effectively represents and reflects the timeless struggle of good and evil, there is an all-too real Mordor-like Kingdom with a king wearing a signet ring that will soon appear on our 21st century global stage. With him will be ten kingdoms and their kings who will yield themselves and their nations to his miraculous Christ-like sudden appearance from a 2000-year old grave. The ten kings will figuratively and very possibly literally kiss his ring of power, the ring worn by Roman Emperors who ruled them all. I have written much about this legendary reappearance return of Antichrist who is none other than the soon-to-be Revived Roman Emperor, Nero. Extensive Scriptural and historical documentation is provided in my non-fiction book, Out of the Abyss … can the number of the beast be solved, 666? But also in several Eye of Prophecy articles such as, Reappearance of the Beast, posted 9-21-13; The Legendary Return of Nero (4-4-15); A Beast by any Other Name is Still a Beast, I, II, III (March, 2015). Today’s article will focus on the ten kingdoms (and whoever the ten kings of those kingdoms might be when the Rapture takes place), with the soon to follow return of Nero from the Abyss. (Revelation 17:8). Those who have read Out of the Abyss or even a few Eye of Prophecy articles are aware that I rarely engage in much, if any, speculation. Instead, the theme/subjects of these writings are based on historical and Biblical evidence (facts). If there is any conjecture (what if), it is derived from historical and contemporary events that logically, reasonably, and feasibly fit into the Biblical prophecies that give us extraordinarily strong clues, but not necessarily specific details. In that context, I will issue a disclaimer that the identity of the ten nations (kingdoms) presented in this article most certainly is supposition, as no one knows with absolute certainly who they will be. If, however, we subscribe to the premise that I and many other students of Biblical prophecy endorse—that the return of Messiah Jesus is as imminent as it has ever been because we are living in the last of the last days—then this speculation is as Scripturally sound as can be. In other words: If Christ were to return today or even in the next few months or years, select identification of these ten nations would be as viable as any time in history. I believe you’ll see that the choice of these kingdoms is based on Scripture, reasonable deduction, and a cogent correlation of what is taking place in today’s world. “Then in my vision that night, I saw a fourth beast—terrifying, dreadful, and very strong … It was different from any of the other beasts, and it had ten horns. As I was looking at the horns, suddenly another small horn appeared among them. There of the first horns were torn out by the roots to make room for it. This little horn … was boasting arrogantly” (Daniel 7:7-8). When compared to another startling revelation given to John as one of many spectacular visions he saw some six hundred years later as recorded in the book of Revelation, Bible scholars (including me) understand that the little horn is Antichrist and the ten horns of Daniel 7 and Revelation 17 are one and the same—kings and their kingdoms aligned with Antichrist (Nero) during the Great Tribulation. “…This fourth beast is the fourth world power (Rome) that will rule the earth … Its ten horns are ten kings who will rule that empire. Then another king will arise, different from the other ten, who will subdue three of them. He will defy the Most High and oppress the holy people (Jews) of the Most High. He will try to change their sacred festivals and laws, and they will be placed under his control for a time, times, and half a time (3 ½ years)” (Daniel 7:23-25). In Out of the Abyss, you’ll find compelling evidence to explain and confirm that the “sudden” appearance of the little horn (Antichrist) and his “difference” from the other ten kings fits precisely with Nero and his abrupt reappearance from the Abyss. And the reason he is so different is because he doesn’t arrive (reappear) on earth by natural birth, as would be expected of a modern-day born Antichrist. There will not be a Revived Roman Empire during the Tribulation, meaning one that is a reproduced replica of the once mighty realm of the Caesars. Instead there will be a Revived Roman Emperor, whose dominion will be Roman in appearance (because of the fact that he is a once great Roman Caesar), and will be a confederation of six powerful European nations plus one non-European kingdom, plus three other dominant nations that will, through force and threat, become part of this ten-kingdom unification. In Daniel Chapter 7 we learn that the Antichrist will subjugate three of the ten countries, with the obvious implication that seven of the ten kingdoms will willingly submit to his authority. The end result will be all ten kings yielding themselves and their kingdoms to the beast-king Antichrist, who initially captures their loyalty because of his astonishing return from the dead (actually the Abyss). As indicated, I have covered this in great detail in Out of the Abyss and past Eye of Prophecy posts, i.e. clear evidence that all-embracing allegiance to the beast by people from every nation and language will be a direct result of his god-like reappearance from the grave (Revelation 13:3-4). This is more of a religious following, but NOT a one world religion. The political and military power wielded by Nero will be centered in the ten kingdoms, but this will NOT be a one-world government as many postulate. Please see Eye of Prophecy articles, One World Government and One World Religion, published 2-28-15 and 8-15-15, respectively. Actually there are two more revelations of the Antichrist beast (who is a man) and his ten-nation coalition, as found in Revelation Chapters 13 & 17. They follow closely with each other and are both part of similar apocalyptic visions seen by John. 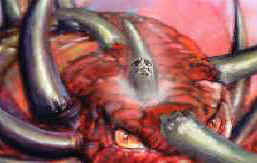 The beast rising from the sea in Chapter 13 has seven heads and ten horns with each horn bearing a crown. These ten horns are the same horns called kings in a subsequent vision of the beast (Antichrist), which also has seven heads, as recorded in Revelation Chapter 17. As fully documented in past articles and Out of the Abyss, the seven heads (also called kings) were historical Roman Caesars, with the ten horns (kings) exclusively future … during the Great Tribulation. “The ten horns of the beast are ten kings who have not yet risen to power. They will be appointed to their kingdoms for one brief moment (meaning during the relatively short time of the Tribulation) to reign with the beast. They will all agree to give him their power and authority. Together they will go to war against the Lamb (Messiah Jesus), but the Lamb will defeat them because he is Lord of all lords and King of all kings. And his called and chosen and faithful ones will be with him” (Revelation 17:12-14). Thus, when we compare and complement the ten kings/kingdoms of Daniel 7 with Revelation 13 and 17, we see that Antichrist’s empire will not be a one-world government; rather, it will politically and militarily consists of ten nations. Albeit, modern-day dominant countries … but still just ten. Yet, the leaders and people of these ten nations will be endorsed by a cross-section of people all over the earth who have already begun to worship Nero for one and only one reason: his perceived supernatural return from the dead. Although those who take the mark of the beast will be many in number, they won’t be able to overthrow by force the governments of the countries in which they reside. Let’s determine why and why not by examining some of the world’s nations, including the pre-Rapture and post-Rapture alliances of which they consist … which is what we see developing prophetically in today’s world and will accelerate abruptly after the disappearance of hundreds of millions of (all) believers at the Rapture. Let’s see if we can logically and deductively identify the ten kingdoms that will comprise Antichrist Nero’s political and military machine. By process of Scriptural elimination, let’s first ascertain which of today’s nations will NOT be among these ten nations, to better and more accurately accomplish this objective. Scripture is sufficiently clear to demonstrate that there will be three main coalitions of nations during the Great Tribulation, one of which will directly oppose the little horn and his ten kingdoms. All three will march on Israel (Middle East) at one time or another during the Tribulation. Because it will take Nero most of the first 3 ½ years of the Tribulation to fully consolidate his base of power and sphere of influence, the third of these coalitions will ignore him and make their own assault on Israel, soon after the seven-year Tribulation begins. *Note: All of the nations mentioned in these three alliances are the more conspicuous nations in today’s world. Prominent in terms of not just population, but also economic and military significance. Other smaller, less influential countries throughout the world will either choose sides or remain neutral; thus, their economic, military, and political participation and contribution will be nominal. Much has been written about this end-times campaign against Israel, including last week’s and several other Eye of Prophecy articles. For purpose of this week’s subject, we simply want to reference the main countries participating in this attack, as directly or indirectly identified in Ezekiel 38 & 39. 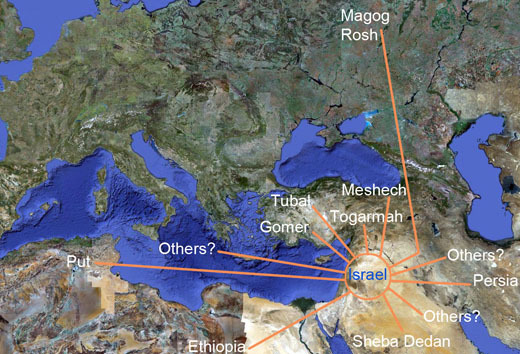 All of these nations will be devastated by the Lord, himself, as they march against God’s special possession, Israel. The Antichrist and his ten-nation federation will, I’m convinced, be among those who simply watch and wait to see what happens when Russia and its allies invade Israel. (See Ezekiel 38:13). The Main Nations: Russia, Iran, Turkey, Ethiopia, and Libya. To also include what is described in Ezekiel as other counties (secondary) that most likely will include the Ukraine, some of the “stan” nations such as Kazakhstan. Also Belarus, Lithuania, Latvia, and Estonia. These nations, I believe, will once again be part of the Russian sphere. Possibly, to include Pakistan and Afghanistan. As indicated in last week’s article (and others), the Gog/Magog invasion is NOT the same as the final tribulation battles known as Armageddon. In addition to the Gog/Magog nations doing their own thing, and to Biblically demonstrate that there will be no such thing as a one-world government (headed by Antichrist or anyone else) during the Tribulation, there are two passages in Scripture that clearly indicate Antichrist Nero and his ten-nation confederacy will face a formidable alliance of substantial power. First from the book of Daniel speaking of the king of the north (Antichrist): “He will enter the glorious land of Israel, and many nations will fall…. He will conquer many countries, and even Egypt will not escape … But then news from the east and the north will alarm him, and he will set out in great anger to destroy and obliterate many. He will stop between the glorious holy mountain and the sea (which is the valley of Megiddo) and will pitch his royal tents. But while he is there, his time will suddenly run out, and no one will help him” (Daniel 11:41-45). “Then the sixth angel poured out his bowl on the great Euphrates River, and it dried up so that the kings from the east could march their armies toward the west without hindrance” (Revelation 16:12). This is the next to last tribulation judgment that will pave the way for a head-on clash between the Antichrist-led alliance and the massive armies of the kings of the east. The Main Nations of the East: Geographically, it’s relatively easy to identify the “kings of the east” as, China, Japan, North & South Korea, Indonesia, and quite likely India. Less weighty counties in this alliance very well could be Malaysia, Thailand, Cambodia, Vietnam, and even the Philippines. Revelation 16:12-16 strongly suggests that the actual confrontation between Nero’s confederation and the eastern alliance of nations won’t last long, and will abruptly end when these two conglomerates and rulers of other nations collectively unite their forces against Christ, himself. At this point late in the Tribulation, there will be a brief semblance of a global military union that will dare to fight against Jesus Christ and the armies of heaven. “And the demonic spirits gathered all the rulers and their armies to a place with the Hebrew name, Armageddon” (Verse 16). But for those who are convinced that there will be a One-World Government during the entire Tribulation period, how can you have such a government unless virtually all nations, especially the most powerful countries are part and parcel of that unified governmental and military system? The answer is: you can’t. Scripture is more than sufficiently clear to show that the major nations on earth will belong to one of these three alliances; with other smaller, less significant countries supporting in some fashion one of these alliances, or attempting to remain neutral. Before we can determine with at least some measure of assurance which ten nations will willingly (seven nations) and reluctantly (three countries) surrender their governments and military to Antichrist, we must once again establish the biographical and geographical origin of the Antichrist, himself. As already indicated in this article, and as previously documented in my book, Out of the Abyss as well as other Eye of Prophecy articles listed earlier, there is abundant evidence in Scripture combined with events of the 1st Century to convincingly confirm that the fifth Roman Emperor, Nero, was the little horn, ruler, and king prophesied by Daniel. And the man of lawlessness alluded to by the Apostle Paul; and the beast-king of Revelation revealed to John. In John’s second vision of the beast, the angel explained the mystery of the woman and the beast. Let’s look again at this astounding disclosure. Said the angel to John: “The beast you saw was once alive but isn’t now. And yet he will soon (abruptly, suddenly) come up out of the bottomless pit … And the people who belong to this world (those left behind after the Rapture) … will be amazed at the reappearance of the beast who had died” (Revelation 17:8, italics for emphasis). The amazing revelations given to John, including the history and future of the Antichrist in Chapters 13 and 17, took place just a few years after Nero’s reign ended in 68 AD. The verse we just read clearly indicates that the beast had been alive and had already died BEFORE John saw the beast. Furthermore, this beast (Antichrist) would come up out of the Abyss—which would, in the clearest language possible, be a (future tense) reappearance of the beast who had died. From where did Nero and all the Roman Emperors rule and reign? Easy answer: Rome, Italy. To what does Italy and twenty-seven other countries belong in today’s world? Another easy answer: The European Union. When the Common Market increased to ten European countries years ago, many prophecy scholars equated it with the ten nations who give their authority to Antichrist. But then the Common Market morphed into the European Union which now has a total of twenty-eight signatory nations. That doesn’t mean, however, that all of these nations will necessarily align themselves with Nero upon his astonishing return (from the dead, as the world will see it); or that Nero would automatically choose more than ten kings and kingdoms (nations) that Daniel 7 and Revelation 17 clearly state will be the core of his (European) coalition. More (countries) is not necessarily better. There can be as much or more unity and cohesiveness concentrated in ten powerful nations than in twenty, or thirty, or however many. There would be less language barriers, less cultural differences, less number of people and governments to argue with or galvanize into a strong centralized cohesive force. 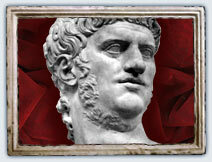 Although Nero could very well establish his sphere of influence from the EU headquarters in Brussels, Belgium, his initial reappearance will be in/at Rome. Where else would it be? His amazing return from the underworld as a Revived Roman Emperor would lead him immediately to Rome, from where he and the mighty Roman Emperors ruled for centuries. But this will not be a revival of the ancient Roman Empire. The only thing resembling such an empire will be a Roman Emperor. Italy is an integral part of Europe and the European Union, which consists of territory much larger than even the ancient Roman Empire. Whether by immediate surrender of their government and military to Nero or by Nero “persuading” certain nations to align with him, he will seek out only the strongest of these countries … in terms of population numbers, economic stability, and military might. In fact, the current EU does not actually have a centralized military as such. It’s readily apparent that only a handful of current European nations possess the population, wealth, and military capacity to transcend the majority of nations within the European Union. In fact, I’m convinced that only six of these nations (that collectively dwarf the remaining twenty-two countries of the EU) will eagerly agree to give Nero, all, “their power and authority” (Revelation 17:13). The seventh kingdom that will voluntarily surrender its allegiance to Nero may surprise you, if for no other reason than it’s not part of Europe. We’ll get to that shortly! Another reason that the six nations in particular and the EU in general will follow the Beast is because nearly 50% of Europeans who claim religious affiliation are Roman Catholics. As many Bible scholars believe (including me), the woman on the beast in Revelation 17 is the Roman Catholic Church headquartered in none other than Rome. Please see the Eye of Prophecy six-part series entitled, The Woman and the Beast, posted in October, November, 2013. Total of 330 million (close to the current population of the United States). Representing 65% of the total EU population of about 508 million. *Note: Belgium is selected over Poland (38 million population and a higher military rank) for several reasons, but the most notable is that the EU headquarters is in Brussels. Thus the six EU nations who very likely will be part of Antichrist Nero’s confederacy are: United Kingdom, Germany, France, Italy, Spain, and Belgium. With the remaining EU countries not a member of Nero’s “inner circle” but those who undoubtedly will serve as mercenaries in his armies and contribute financially as much as they can or will be commanded. An Arab Coalition Known as the Persian Gulf States: Headed by Saudi Arabia and comprised of Oman, United Arab Emirates, Bahrain, Iraq, Qatar, and Kuwait (Seven in all!). Though they will provide some military assistance, the more obviously substantial contribution from this Arab kingdom that will unify as one entity is that of … you guessed it: Money. The combined oil wealth of these nations is staggering—just what Nero needs to fund his ten-nation Leviathan that will do battle with the kings of the east, with Israel, and inevitably Messiah, himself. The two factors or reasons for including this Arab coalition as one kingdom are found in Scripture and in the contemporary phenomena of what’s happening all over Europe, but especially in the six nations selected. Scripture: Referring to the Antichrist, the prophet Daniel tells us: “Instead of these, he will worship the god of fortresses—a god his ancestors never knew…. Claiming this foreign god’s help, he will attack the strongest fortresses. He will honor those who submit to him, appointing them to positions of authority and dividing the land among them as their reward” (Daniel 11:38-39). I’ve written about this at some length in my book, Out of the Abyss. Time/space in this article does not permit; suffice to say that this god referenced in Daniel is, I firmly believe, the god of Islam, Allah. Nero will feign allegiance to Islam and the Muslim agenda to generate as much support as possible from Islamic sources … in this case primarily from the wealth of the Muslim Gulf States. The Astonishing Increase of Muslims in Europe: Hardly a day goes by without media focus on the refugees pouring into Europe; but also the years of Muslim immigration to Europe, especially to the six EU nations identified as soon-to-be members of the Antichrist’s massive merger. So, we now have seven of the ten kingdoms in place, which leaves the three countries who will be forced to join the monstrous alliance of the beast. However, once they become part of Nero’s fold, it’s logically evident that they will be a formidable addition to the ten-kingdom league, and will do so with increased enthusiasm. The Three Remaining Nations Will Be: Australia, Canada, and The United States. “Really … the United States?” you question. Yes, Canada and Australia, too. First and foremost, each of these countries are fiercely democratic and independent. They will not readily join forces with what they undoubtedly will perceive as totalitarian, nor a tyrant no matter how enthusiastically he will be welcomed by a world in chaos and confusion. However, the United States, and to a lesser degree Canada and Australia, will experience a substantial loss of population when millions are taken in the glorious Rapture. Which is the primary reason that the United States will not be able to economically or militarily do anything about the Russian-led (Gog/Magog) invasion of Israel soon after the Rapture. Nor will America, Canada, or Australia pose any obstacle to the enormous bloc of eastern nations. And certainly not to Nero’s agenda of establishing a powerful dictatorial ten-kingdom federation to include these three countries that, though considerably weakened, will still exert an impressive influence on this global scene of temporary anarchy. The natural resources and technology of these three countries would be enticement enough for Nero. As independently self-sufficient as these three nations are and still will be (to a lesser extent), they also will not want to lose their standard of living and Western way of life … all of which will have been shaken to the very core by global upheaval caused by the sudden disappearance of hundreds of millions the world over. Consequently, America, Canada, and Australia will inevitably yield their political, economic, and military allegiance to Nero and the other seven nations. They will succumb to what will probably be extensive economic sanctions and daunting military threats against them. Their capitulation to Nero’s invitational-style demand (please join us … or else) to enter his coalition will be reluctant at first; but then they will participate enthusiastically when they see the astounding accomplishments of Nero’s early program to pacify Europe during the first year or so of the Tribulation. *Note: It’s also quite possible that select countries from Central America (Mexico) and South America (Brazil, Argentina, Chile, Peru) will merge with the United States and form a national coalition of “The Americas.” If so, it will still be just one of the ten nations (kingdoms) aligned with Nero. As mighty as the six European nations aided by the Arab Gulf States will be, when you include these three weakened, but still formidable and viable nations, Nero will field an economic and military giant that even the mighty Eastern kingdoms will not take on. Not, that is, until the very last days of the seven-year Tribulation. Furthermore, the Russian confederacy of Gog/Magog will pose no threat to the Antichrist, as this alliance will be destroyed by the Lord, himself, soon after the Rapture. *Note: There will actually be a 4th coalition, headed by the King of the South (Daniel 11:40-43); however, this alliance will be easily and quickly overwhelmed by Nero and his ten nation kingdoms. The text strongly suggest that this southern threat will be led by Egypt, with what’s left of Ethiopia and Libya (after the Gog/Magog defeat) and most likely other African nations, such as the Sudan, Nigeria, and Algeria … perhaps South Africa. Once again, I must issue a disclaimer (acknowledgment) that the selection of these ten kingdoms is part speculation, but also part logical application of Scripture to contemporary global developments. However, I firmly believe, for example, that identification of Nero as the Antichrist and other Biblical prophetic applications found in some Eye of Prophecy articles (such as the Two Witnesses of Revelation 11) are much more than mere theory. In fact, Revelation’s author John, and accordingly all believers, are challenged to ascertain the mysterious identity of the beast and of the woman. (Revelation 13 & 17). Thus, the vast majority of prophetic studies—correlations, connections, clarifications, counsel, and conclusions found in the book Out of the Abyss and Eye of Prophecy articles—are based on sound application of Biblical passages and historical and contemporary events. Read them for yourself, and decide. There are also many (most) passages of which the meaning is crystal clear and the prophetic fulfillment will most certainly come to pass. Such as: “But then the court will pass judgment, and all his power will be taken away and completely destroyed. Then the sovereignty, power, and greatness of all the kingdoms under heaven will be given to the holy people of the Most High. His kingdom will last forever, and all rulers will serve and obey him” (Daniel 7:26-27). From the context of that passage and other passages relating to it, we know beyond any doubt that the Lord will conquer Antichrist and his ten-kingdom coalition, as well as all rulers and nations who would vainly oppose the everlasting Kingdom of the Most High God.